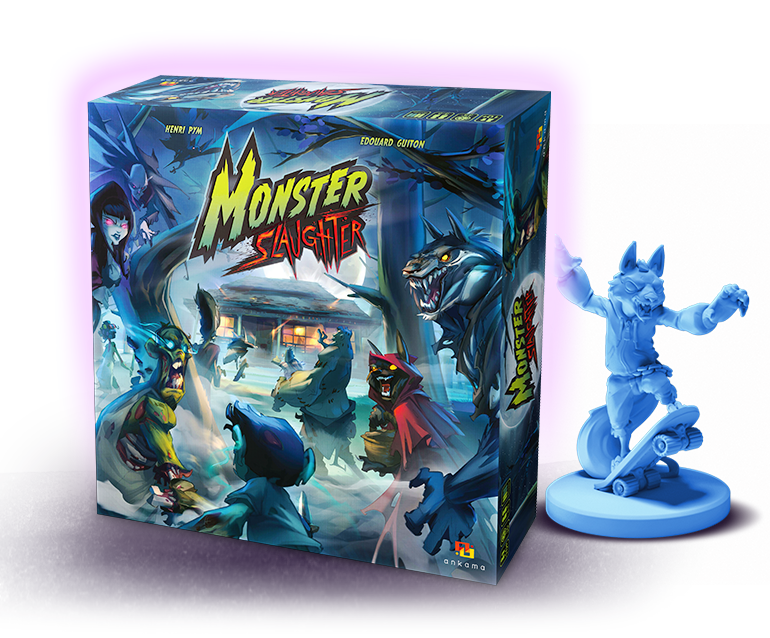 Consisting of four playable areas, it also contains all the information necessary for each game of Monster Slaughter. Consisting of five rooms, this is the key component of the game. In a classic game, the teens hide in each room within the 3D board. These are the victims of the game, the main objectives. There are five of them, and each has a unique ability. There are four kinds of tokens. Injury tokens are earned by injuring humans. Brain tokens are collected after a human dies in the order a player predicted. Bone tokens go to the current player after they kill a human. Lastly, Blood tokens are awarded to the current player if they personally kill their primary target, which is determined at the start of the game. They allow each player to arrange a prediction of what order the teenagers will die in - without their opponents being able to see it. The search decks each represent an area inside the cabin (the living room, the kitchen, the bedroom, the bathroom, and the washroom). The cards are placed randomly in each search deck at the start of the game. A teenager card is then placed at the top of each pile. These are interchangeable and allow you to enter the house. You have to break them down to get inside the cabin, which results in scaring the teens but forces you to shuffle the search decks. Each player has three figurines, together forming a single family. The five teenagers and the surprise guests are also represented by figurines. It shows values between 11:00 p.m. and midnight equal to the number of turns played in a game. It is used to discard each action, weapon, and trap card. It is composed of several cards, each representing an event that determines how a turn progresses. For each action requiring a dice throw, use the number of dice shown on your character card. The teens have their own dice to defend themselves if they're armed. Each card tells you about a character's abilities, while also indicating the number of actions they can take each turn, how many dice to throw, and the unique ability associated with their family. Learn more about the game by skimming through the topics below.